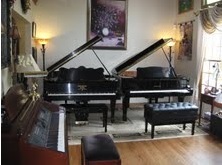 Valois Academy offers the finest in pianos and digital instruments for audio and video recording. Digital Kawai - цифровое пианино (синтезатор) с возможностью записи CD. Это пианино сделанное из рельного красного дерева включая клавиши. Оно имеет реальный звук через электронную клавиатуру. Оно может синтезировать звучание более, чем 850 музыкальных инструментов, а также имеет такие спецэффекты как шум ветра, дождь, гроза, волны, и т.д. I often use the Kawai piano to record music CDs for my students. It helps keep track of their progress. It also makes a great gift or a memorable suvenier, either for the student or the family. Many years from now, these recordings will bring back wonderful memories. I just recorded a nice Christmas CD for every student. What a beautiful gift for Christmas! "The studio has two acoustic grand pianos: Yamaha C and Hamburg Steinway and Son, 1872, fully restored in New York at Steinway Factory". This piano is a great model, digital Yamaha Clavinova. You can plug the head phones, microphone, and even the electric guitar to it! The good dynamics help to produce a real sound of a Grand piano without the digital sound. It has more than 700 different instruments’ sounds. You can push the button and play Spanish guitar, fluit, choir, banjo, etc. And sound will be very real. I have many students who come for lessons with brothers or sisters. I even have some parents who take the lessons from me. During their lesson the other family member can plug the headphones and practice, using this piano silent for the others.